Showers associated with the cold front will be offshore sometime during the next hour. 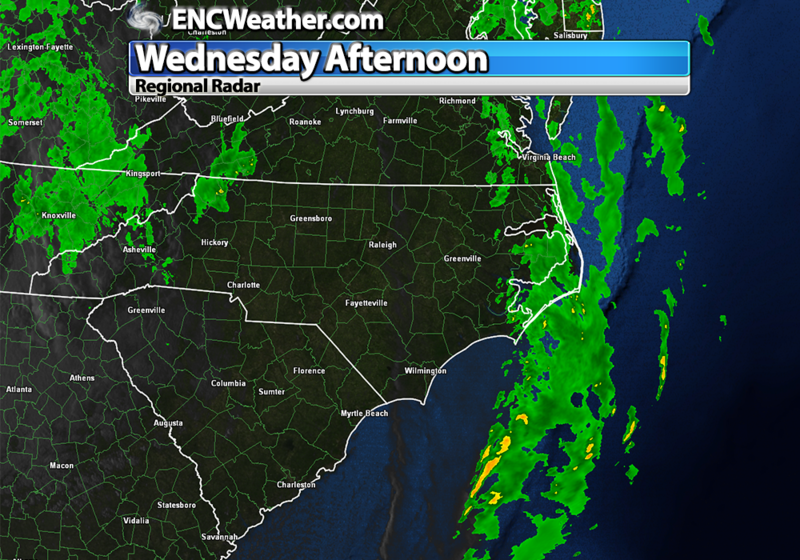 The cold front forecast to move through ENC is finally starting to push offshore. The severe weather anticipated with this front ended up busting as the atmosphere was unable to destabilize leaving very little fuel for convection. Instead most of the area saw a lot of rain. The station gauge here in Greenville measured 0.75″ today. This was below originally forecast due to less convection. The area will continue to dry out overnight and Thursday will be met with high temperatures back into the middle 70s making it feel more like fall. High temperatures remain in the mid 70s until this weekend when another cold front is forecast to move through the area. Atmosphere looks dry in advance of the front and do not see high chances of rain associated with this front at this time. High temperatures will once again fall with the passage of the weekend front with high temperatures ranging from upper 60s to lower 70s across the area. Hurricane Gonzalo continues to remain a major hurricane in the tropical Atlantic. Current forecast sends it on track towards Bermuda where Gonzalo will weaken very little prior to passing near or over the island this weekend. Hurricane warnings have already been posted there as they prepare for major damage. Gonzalo does not pose a risk to the CONUS.